MessyJesse - a quilt blog by Jessie Fincham: The Finished Granny Square Quilt! The Finished Granny Square Quilt! I peiced the back with a pink stripe by Sevenberry and a blue floral print by Moda's 30s PlayTime collection. I hand-stitched the binding on, and machine quilted some simple straight lines to bring out the granny sqaures :) I'm really pleased with how it turned out, and I can't wait to get it washed so it has that lovely crinkly look. Thank you all so much for your encouraging comments along the way, I don't think I could have finished it without all your kind comments! :D Right, now on to the next one! Congratulations on finishing it ! It is so pretty! Congrats on a beautiful finish! What a pretty fresh little quilt. I love the binding fabric. it is so beautiful...and love the rose binding...fantastic! 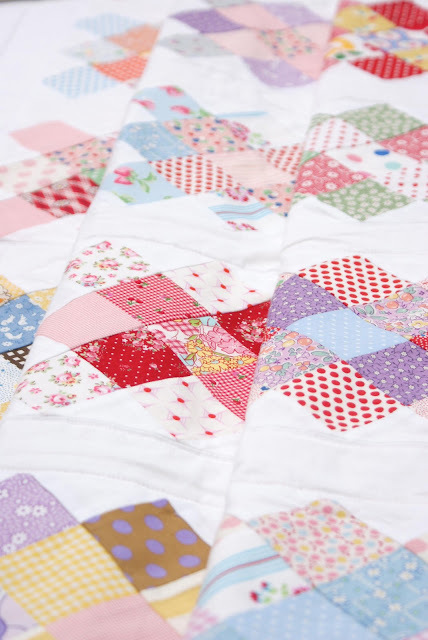 That is such a lovely quilt! Congrats on finishing it! I L♥VE THE BINDING. IT is IT! Fabulous. Well done. Absolutely gorgeous and great photos too. I love the floral binding it's a great contrast with all the other fabrics. It looks gorgeous I love it. I'm planning on making my 1st quilt this summer and I think I'm going to base it on this design. Thanks for sharing. Wow, it is so pretty! I really like it. It's so, so wonderful! I love it! Beautiful Jesse! Such a lovely mixture of fabrics in there. Love the binding fabric too. The delightful luxury of Cath Kidston if I'm not mistaken! Great job! It's wonderful! I like a lot the floral fabric you have choosen for the bias. You'll feel very proud of you when you'll rest covered with it. Your finished quilt is so sweet, I really like the soft colors. I just tried this block too, it's a lot of fun to make! I have been following you since for a long time and I really like your all jobs. 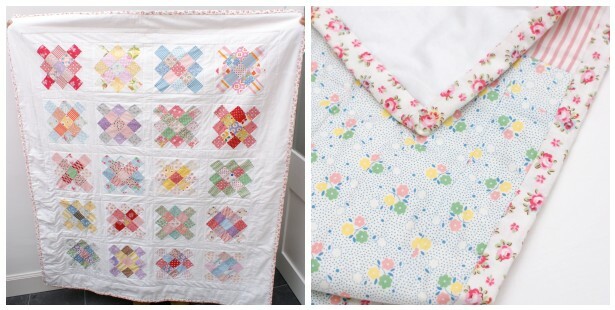 This quilt is amazingly wonderful and I hope, a day I can sew like this thing. Thank you for your kind words on my granny cushion by the way, it is greatly appreciated! So sweet! I can't wait to finish mine and start another one! Sweetness! I LOVE your GS quilt! I love this! 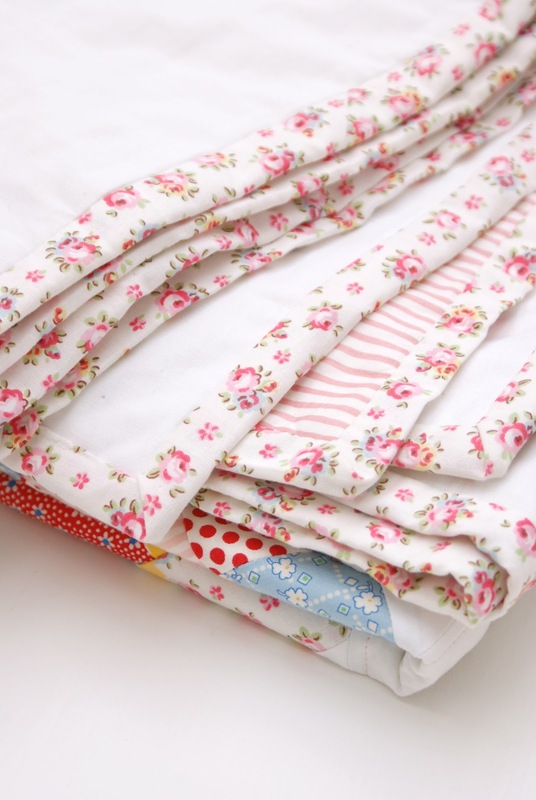 There's just something about white fabric and 1930s prints....they're beautiful together! I still need to quilt my granny square quilt. How did you do your lines? 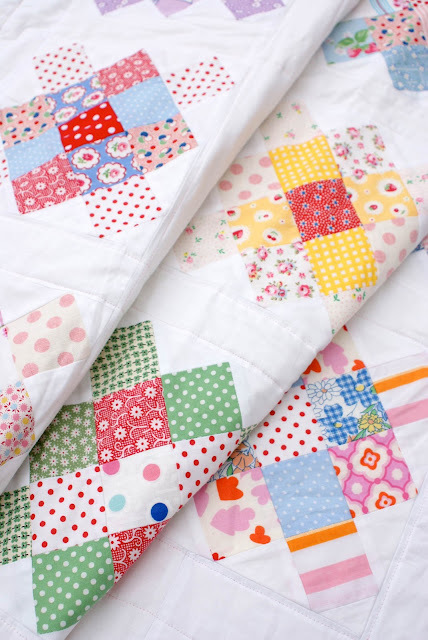 I just discovered you through Heather & Megan and just wanted to say that I love your projects (including this Granny Square quilt), your blog is great!